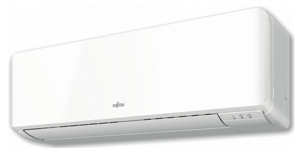 Fujitsu ASYG Wall Mounted Fan Coil Unit systems are offered in 4 ranges LT, LU, LM and LF. Cooling Range from 2.00kw up to 8.00kw and Heating from 3.00kw up to 8.80kw. All fan coil units have the choice of 4 fan speeds resulting in Sound Pressure levels as low as 21dBA. Ideal for Offices and Residential applications the stylish fan coil units blend in with most interiors. With high EER (Energy Efficiency Ratio) and COP (Coefficient of Performance) ratings, low running costs are also an attractive feature. Installation Materials can also be purchased.